"We will be registering people to vote at movie theaters across the country so that we can #wakandathevote at the ballot box." "Black Panther" is more than a movie for the black community. It serves as a symbol for black joy and positive representation -- and three women are using its momentum in a productive way. In October, Kayla Reed, Jessica Byrd and Rukia Lumumba launched the Electoral Justice Project (EJP), which is a project by the Movement for Black Lives that aims to fight for and advance the rights of black Americans. Now, as part of the EJP's initiative and to coincide with the much-anticipated theatrical release of Black Panther, the women told Blavity on Thursday that they are launching a new mission called #WakandaTheVote, an initiative that plans to mobilize political engagement at several "Black Panther" screenings around the country during the first few weeks of the film's opening. "The Movement for Black Lives is an ecosystem of black leaders and organizations fighting every single day for the healthy and happy lives of Black folks," Byrd and Reed told Blavity. "We are effective because we meet our communities where they are, whether that's in the streets, at the city council meeting, or in the movie theater. "This weekend we wanted to meet our people in Wakanda," they added. "We know that for some it's a superhero world, but we know that the world we deserve is still waiting to be built — and we want to build it! This upcoming spring and November 2018 midterm elections are an important step in building that new world, and we want to take every opportunity to engage our communities in the conversation of electoral justice. 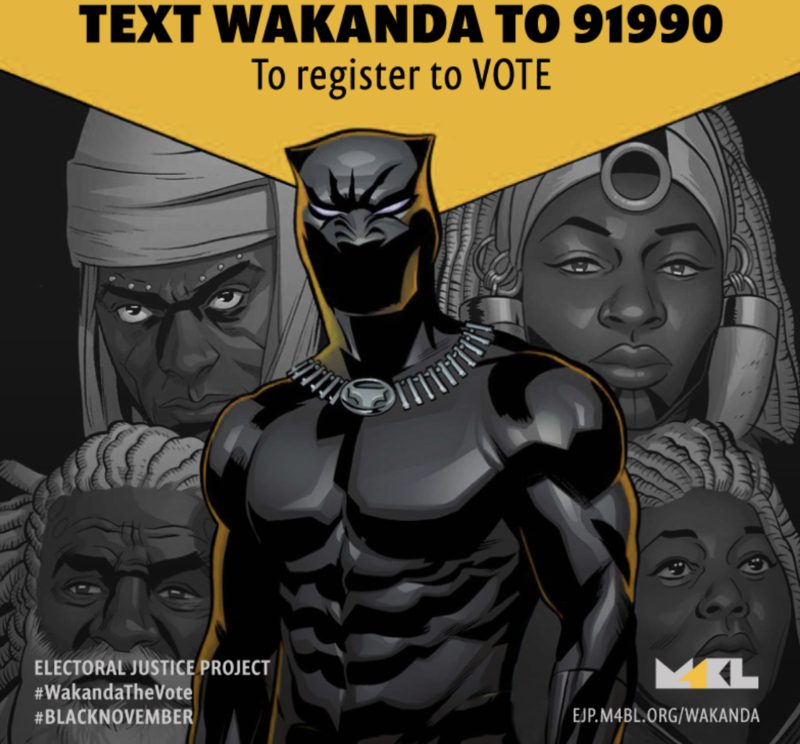 We will be registering people to vote at movie theaters across the country so that we can #wakandathevote at the ballot box." Byrd and Reed told Blavity they have an important mission and a big vision for the EJP, which they said they launched in October to let the world know that they plan to use every tool available to fight for black people. "Over 1,000 people joined our launch call, and we've been building out an exciting campaign ever since," they noted. "We will be engaged in actions all over the country to educate and motivate black voters as well as launching an intensive campaign manager institute this spring called the Electoral Justice League. We intend to have 1,000s of conversations with black people as well build a fun and life-affirming political home that isn't transactional, but transformational." #WakandaTheVote has all of our support! For more information head to the Movement for Black Lives website.